Protests over an anti-Muslim film turned violent Friday across Pakistan, with police firing tear gas and live ammunition at thousands of demonstrators who threw rocks and set fire to buildings. At least 17 people were killed and dozens were injured. Muslims also marched in at least a half-dozen other countries, with some burning American flags and effigies of U.S. President Barack Obama. Pakistan has experienced nearly a week of deadly protests over the film, “Innocence of Muslims,” that has sparked anti-American violence around the Islamic world since it attracted attention on the Internet in the past 10 days. The deaths of at least 47 people, including the U.S. ambassador to Libya, have been linked to the violence over the film, which was made in California and denigrates the Prophet Muhammad. The Pakistani government declared Friday to be a national holiday _ “Love for the Prophet Day” _ and encouraged peaceful protests. The U.S. Embassy spent $70,000 for advertisements on Pakistani TV that featured Obama and Secretary of State Hillary Rodham Clinton denouncing the video. Their comments, from previous public events in Washington, were in English but subtitled in Urdu, the main Pakistani language. The deadliest violence occurred in the southern port city of Karachi, where 12 people were killed and 82 wounded, according to Seemi Jamali and Aftab Channar, officials at two hospitals. Armed demonstrators among a crowd of 15,000 in that city fired on police, according to police officer Ahmad Hassan. The crowd also burned two cinemas and a bank, he said. Five people were killed and 60 wounded in the northwestern city of Peshawar, said police official Bashir Khan. Police fired on rioters who set fire to three movie theaters and the city’s chamber of commerce, and damaged shops and vehicles. One of the dead was identified as Mohammad Amir, a driver for a Pakistani TV station who was killed when police bullets hit his vehicle, which was parked near one of the cinemas, said Kashif Mahmood, a reporter for ARY TV who also was in the car. The TV channel showed doctors at a hospital trying unsuccessfully to save Amir’s life. Police beat demonstrators with batons and launched volleys of tear gas. Later in the day, tens of thousands of protesters converged in a neighborhood and called for the maker of the film, an American citizen originally from Egypt, to be executed. 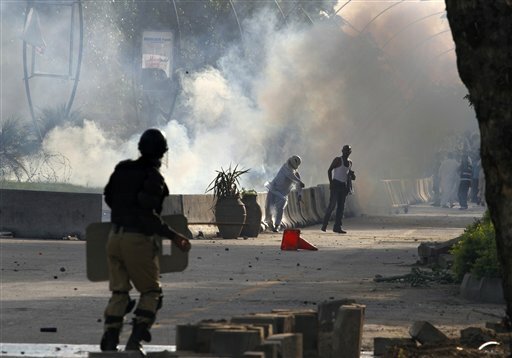 Police and stone-throwers also clashed in Lahore and Islamabad, the capital. Police fired tear gas and warning shots to try to keep them from advancing toward U.S. missions in the cities. Hospital official Mohammad Naeem says 45 people were wounded in Islamabad, including 28 protesters and 17 police. Police clashed with over 10,000 demonstrators in several neighborhoods in the capital, including in front of a five-star hotel near the diplomatic enclave where the U.S. Embassy and other foreign missions are located. A military helicopter buzzed overhead as the sound of tear gas being fired echoed across the city. The government temporarily blocked cellphone service in 15 major cities to prevent militants from using phones to detonate bombs during the protests, said an Interior Ministry official, speaking on condition of anonymity because he was not authorized to talk to the media. Blocking cellphones could make it harder for people to organize protests as well. Pakistan’s Foreign Ministry on Friday summoned the U.S. charge d’affaires in Islamabad, Richard Hoagland, over the film. Pakistan has banned access to YouTube because the website refused to remove the video. Pakistani Prime Minister Raja Pervaiz Ashraf urged the international community to pass laws to prevent people from insulting the prophet. Denying the Holocaust is a crime in Germany, but not in the U.S.
U.S. officials have tried to explain to the Muslim world how they strongly disagree with the anti-Islam film but have no ability to block it because of free speech guarantees. In the Sri Lanka capital of Colombo, about 2,000 Muslims burned effigies of Obama and U.S. flags at a protest after Friday prayers, demanding that the United States ban the film. In Bangladesh, more than 2,000 people marched in the capital, Dhaka, and burned a makeshift coffin draped in an American flag and an effigy of Obama. They also burned a French flag to protest the publication of the caricatures of the prophet. Small and mostly orderly protests were also held in Malaysia and Indonesia. Thousands gathered in Lebanon’s Bekaa Valley for the latest in a series of rallies organized by the Shiite militant group Hezbollah. Protesters carried the yellow Hezbollah flag. Hezbollah appeared to be trying to ensure the gatherings don’t become violent, planning them only in areas where Hezbollah has control. None of the rallies targets the heavily fortified U.S. Embassy in the hills outside Beirut. Police clamped a daylong curfew in parts of Indian-controlled Kashmir’s main city, Srinagar, and chased away protesters opposing the anti-Islam film. Authorities in the region also temporarily blocked cellphone and Internet services to prevent viewing the film clips. Iranian President Mahmoud Ahmadinejad also lashed out at the West over the film and the caricatures in the French weekly, Charlie Hebdo. In Germany, the Interior Ministry said it was postponing a poster campaign aimed at countering radical Islam among young people due to tensions caused by the online video insulting Islam. It said posters for the campaign _ in German, Turkish and Arabic _ were meant to go on display Friday in German cities with large immigrant populations but are being withheld because of the changed security situation. Germany is home to an estimated 4 million Muslims. Associated Press writers Munir Ahmed, Zarar Khan and Sebastian Abbot in Islamabad; Nasser Karimi in Tehran, Iran; and Aijaz Hussain in Srinagar, India, contributed to this report.